Norway – one of the most wonderful and magical places in Europe. Stately fjords and marvelous landscapes may impress everyone. Let’s discover this fantastic country! When speaking about Norway nobody would ever forget to mention the fjords. These marvelous natural landscapes fascinate devotees at any season. The Geirangerfjord is among the most famous and longest ones in Norway. This attraction is situated at almost the same distance from the two biggest cities of the country – Oslo and Bergen, so is easy to reach. Stretching for 15 kilometers to the West of the country it opens great sights for tourists with waterfalls and beautiful mountainous scopes, and gives perfect opportunities for making photos. The Geirangerfjord took its name from a small village of Geiranger located at the point where the Geirangelva River becomes a fjord. Here you will enjoy traveling on a car ferry or getting to the fjord by boat from the river. Many charming mountain farms are located at the sides of the fjords. They are reachable from the land as the steep mountains and jagged peaks provide a hazardous access. There are a couple hotels (mostly in Geiranger) and many camping sites available as the place is also a popular hiking attraction. The general view of the gorgeous summer-green mountains with snow-covered peaks the whole year round as well as the deep blue grand waters make this place one of the most beloved Norwegian tours. 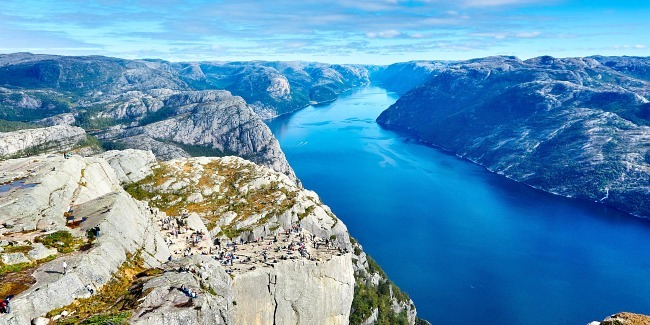 Moreover, the Geirangerfjord has been a UNESCO World Heritage Site since 2005. The region of Lapland stretches on the territory of three countries – Sweden, Finland and Norway. Although this chilly fairy-tale county is the least populated area it is among the top attractions and the most toured in winter Norway. If you are planning to visit Lapland make sure to include an overnight stay in an ice hotel in your program. It is a unique experience on its own but what makes it really special is the opportunity to see the miraculous Northern Lights right from the comfort of your bed. Lapland is greatly visited not only in winter but at the long-term period from October to April as the extreme climate gives exciting opportunities for winter sports and activities. Situated close to the sea, crab fishing is very popular tourist activity here. You can also go on a snowmobile safari or a husky dog sledding adventure. And don't forget to enjoy traditional meals at exquisite restaurants with panoramic views! This is the largest stave church in Norway built in the 13th century and restored in 1849–1851. It is located in a small village of Heddal in Notodden municipality near a river opening a gorgeous mountainous scenery. The architectural structure is introduced by triple naves combining both the Romanesque and Gothic styles. The local legend tells that the church was built by farmers in thee days and was named in honor of the Virgin Mary. Heddal stave church is built entirely of wood and is still open today for Sunday services and wedding ceremonies in the warm spring and summer time. Voringfossen is a breathtaking waterfall located in Mabodelen in the municipality of Eidfjord - a narrow valley of a fjord. It is close to the highway connecting Oslo with Bergen, so this point of interest is conveniently reachable. Cascading down 180 meters, the waterfall's top is reachable on foot opening an awe-inspiring view. Although Voringfossen isn't the highest waterfall in Norway it is the most famous one. The place is adjusted for tourism and it has been a famous sight for about 200 years. Bryggen is a stunning wharf by the shore of a fjord. Situated in Bergen – the second biggest city in Norway, it has been a trading port since the 14th century. The place is a museum itself as it has managed to preserve its original structure and architectural cityscape. The oldest and tallest building in the area is St. Mary's Church built in 1180. For these reasons, Bryggen was listed as a UNESCO World Heritage Site. A trip to this spectacular part of town would be the best choice for those who love tourism in all its aspects. Bryggen's close location to the fjord with its typical mountainous banks makes the whole place a #1 Norway attraction. The Viking Ship Museum complex in Oslo is a unique and picturesque must-see. The expositions vividly show the every-day life of Vikings whose martial lifestyle implied extensive usage of ships. The most precious exhibits here are the Gokstad ship together with the Tune ship - the oldest and best preserved 9th century wooden ships in the world. The Oseberg ship which was excavated completely whole from a great ship burial is the Viking Ship Museum's most famous exhibit. Many smaller ships and boats are also on display. Besides the shipborne aspects, household and daily items mostly found in Vikings' graves such as tools, carts, furniture and textiles are exposed as well. The Viking Ship Museum is a scientific part of the Museum of Cultural History and of the University of Oslo, the exhibitions are regularly renewed. For tourists coming to Oslo the museum has become one of the top 10 attractions in Norway as an indispensable part during a visit to the capital. Flam trains run on the legendary 20.2-kilometer railway between Myrdal and Flam. The train ride has become an extremely favored tour for visitors from all over the world. It has been listed among "The World’s most incredible train journeys" and is of course considered one of best Norway attractions. The very construction of the Flamsbana Railway is thought to be a great engineering masterpiece as it was built handling the extremely high gradient of the mountains. The route is open all year round and is one of the steepest train rides in the world. The spectacular train journey starts from a very high mountain plateau at Myrdal (863.6 meters above the sea level) and takes you down to the fjord by the valley of Flam. During the journey the train enters numerous twisting tunnels in the rocks. The one-hour trip offers jaw-dropping incredible panoramic views of snow capped mountains, powerful waterfalls, the beautiful Aurlandsfjord and the unforgettable Norwegian nature. Upon you arrival in the petite town Flam you can take walking trips, go kayaking or on a fjord safari taking profits of the fjords' natural wonders surrounded by majestic cliffs. All in all Norway is a diverse and many-sided Scandinavian country,which means that there is always place for your adventures and discoveries.